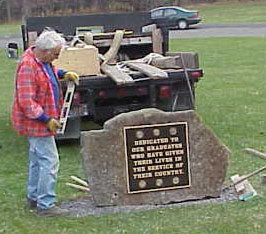 Today the stone Veteran's Monument was delivered to the front circle area at Smethport Area Junior Senior High School. 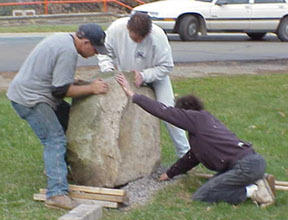 Jeff Keppel and the Crew set the stone in its place for tomorrow's important dedication ceremony. 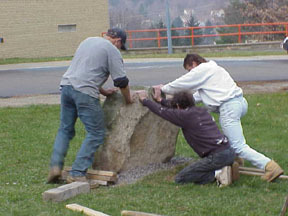 The heavy stone was slide off the truck and then placed in proper position. 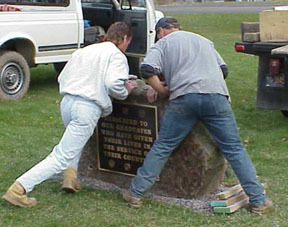 Jeff made sure the stone had proper placement! Proper level had to be checked. 11th day of the 11th month at the 10th(?) hour 1999.